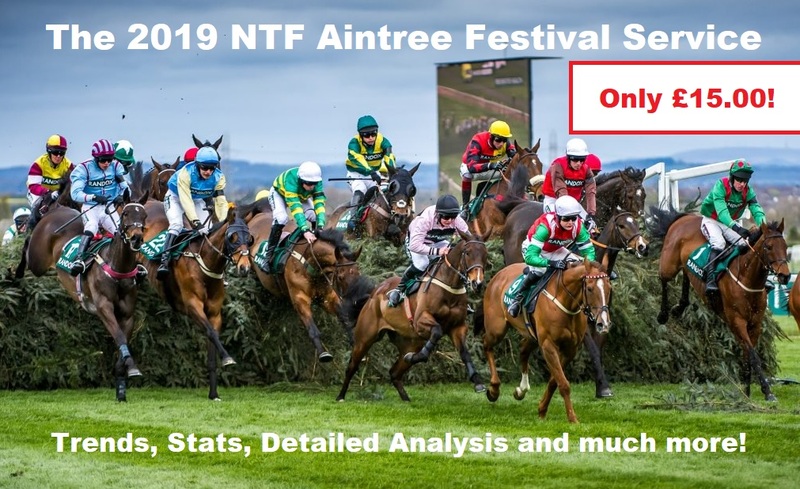 Join NTF for the 2019 Aintree Grand National Festival and gain access to the exclusive NTF Members Area for three of the most exciting days of the National Hunt season!! Once again I'm opening the doors to NTF for those of you that want to hook on for Aintree Grand National week. Secure your NTF Aintree Festival slot TODAY for only £15.00! Only £15.00 to hook onto the main service for Aintree week! Exhaustive post Festival notes, with comprehensive trends, stats, angles and pointers from the 3 days of festival action. Unexposed Handicap Chasers offer up a wealth of profits and I’ll make sure you don’t miss any opportunities to secure your slice of the pie. Highlighting, tracking and then backing the runners that are skipping under the radar of the wider betting population. Compiling an ante-post dossier for future races so that members are fully prepared for the major races. Bounce around ideas with the well-informed NTF members in the members comments section for each and every post. NTF is primarily a race analysis service, concentrating on the major races throughout the National Hunt season. Only £15.00 for full uninterrupted access to the NTF Members Area for the 2019 Aintree Festival! The other main component of NTF are the Weekend Notes. ​​​​​​​I produce in-depth notes for NTF Members each and every Monday of the National Hunt season, with the notes sometimes running to 16 pages+. Essentially there is no upper end to the notes, it's pretty much just when my brain empties! The NTF Weekend Notes are some of the most comprehensive racing notes you will find ANYWHERE (including on sites such as the Racing Post, Attheraces & SportingLife) and are a fantastic addition to any serious or part-time punters portfolio, especially if you don't have the time to construct such detailed notes yourself. Only £15.00 for full uninterrupted access to the NTF Members Area for the 2019 Aintree Grand National Festival! I, Ben Aitken, have been sharing my own in-depth analysis with many dedicated NTF Members for almost ten years now. In that time NTF has grown from strength to strength and evolved with each passing year, developing existing analysis techniques as well as introducing and modify new and previously used methods. I have honed my in-depth racing knowledge over many years of dedicated study and many (MANY!) hours of analysing the form books and racing databases or simply trawling through countless race replays. My analysis, however, isn't just a straight forward "here are my selections, go ahead and back them' approach. You can use my guides in that way if you so desire but I have made sure that the guides are set out in such a way so that you can completely disregard my own selections and use the information provided in your own way and to your own advantage. NTF is NOT a tipping service. It is so much more than that. My aim is to provide thorough and unique analysis, which whilst obviously aiming to be profitable also aims to educate and provide alternative approaches to the mainstream and readily available angles that are already out there. The NTF race guides set themselves apart from the crowd with their unique, uncomplicated style whilst allowing the reader the opportunity to utilise the guides to their own advantage, using their own thought process to come to a conclusion THEY are happy with. The race analysis guides are merely the cherry on top of the NTF pie, however, as it's the many other bodies of work available to full members (Weekend Notes, UTR Squad, Front-Runner-Focus, Ante-Post Analysis...) that really make NTF one of the best value racing service currently available. Special 2019 Aintree Grand National Festival offer! Don't miss your slot! What I think you get from Ben is a service that teaches about how to analyse horse racing to a level of depth not available elsewhere. He does the "heavy lifting" which I cannot do - time and knowledge, but following up on some of the suggestions is what has moved me from novice to profitable. That is an amazing piece of analysis on the Kerry National! More power to your elbow Your NH analysis is essential reading. My first ever comment but I have to give you a great big thank-you… I was late leaving to go the pub for Sunday lunch, didn't have time to study and liked all three selections, so I did a simple treble on the nose and got 164/1!! Oh my… sign me up for a lifetime membership! Good day at the office Ben 🙂 nice one mate you deserve it with all the hard work you put it. Well done Sir! £30 split as follow: £5 on each of the 3 to win, £9 combination trickster and £6 combination forecast returns £933 profit. Hi Ben, as a trial member I have to confess I'm very impressed not just with the results but the research behind them as well as all the other content ie the blog etc etc. I, like so many love racing, even simply reading quality content lifts my spirits. You are obviously more than just a tipping service and I would love to join as a full member.